1. Wage growth was up in the jobs report. 2. More wage growth causes higher inflation. 3. Higher inflation causes the Fed to increase its interest rate target. 4. Even with the same FOMC composition as we had last week, we might anticipate tighter monetary policy in the future on Friday's news. 5. With dovish Janet Yellen gone from the FOMC, and with a (possibly slightly) less dovish Powell as chair, hawkish regional Fed presidents voting in 2018, and the addition of hawkish Governors (Quarles, Goodfriend, and whoever else gets nominated and confirmed to the empty Governor slots) we could get four 25-basis-point interest rate target increases in 2018. 6. Higher interest rates reduce output. 7. If future output is expected to be lower, that lowers current stock prices. In the chart, I've normalized by setting each variable to 100 at the start of the last recession. Productivity, by this measure, has been close to flat since the end of the recession, but the real wage is still catching up to it. Economic theory tells us that productivity growth should determine growth in the real wage, and that seems roughly consistent with the chart. 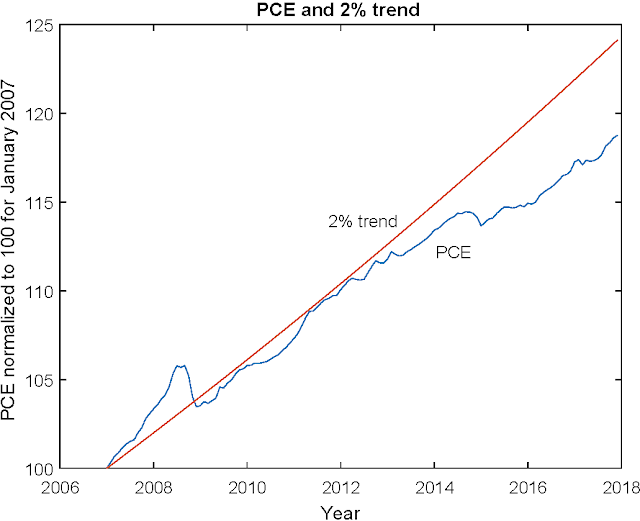 If the Fed had been following a price level target rather than an inflation target, there would be a lot of ground to make up - relative to base period of January 2007, the PCE deflator would now be 4.5% below the 2% trend path. This reflects the sense in which the FOMC is not achieving symmetry in its inflation targeting procedure. Inflation targeting with symmetry, i.e. caring as much about positive as about negative deviations from the 2% inflation target, should achieve roughly the same outcomes as price level targeting. So, the 10-year breakeven is above 2%, and the 5-year is under 2%, but close to it. For the Fed, this is good news, as it says that market participants expect the Fed to hit its inflation target (roughly) on average for the next five years, and for the next 10 years. TIPS are indexed to the consumer price index, which is upward-biased measure of inflation, so we might be a little more comfortable if these measures were 10 or 20 basis points higher, but this is pretty good. As is well-known, the yield curve tends to be flat or negatively sloped leading a recession. One reason for this could be that monetary policy moves slowly, and the markets see a recession coming before the Fed cuts rates significantly. But the markets anticipate that the Fed will cut interest rates during the recession, and this then is reflected in long bond yields. So the yield curve flattens, or short-term interest rates might even exceed long-term rates. The slope of the yield curve right now is just short of its average in the sample shown in the chart. The average is 1.55%, while the current value is 1.38%. So the yield curve is definitely not flat currently, and if we relied on yield curves to predict recessions, we wouldn't be predicting one anytime soon. What's the conclusion? There's not really any sign of excessive inflation in the data. There are indeed signs that inflation, and anticipated inflation, are very close to what is consistent with a 2% inflation target, for the indefinite future. So, I'm having trouble drawing any connection between the behavior of inflation, the behavior of the Fed, and the drop in stock prices. Inflation has been coming up recently, as nominal interest rates have gone up (that's the 3-month T-bill rate in the chart). That's consistent with Neo-Fisherian logic - increase the nominal interest rate if you want more inflation. Of course, inflation was low in 2014-2015 in part because of a fall in the price of crude oil. Nevertheless, some people were arguing that inflation would go down as a result of the Fed's interest rate hikes, and that certainly hasn't happened. 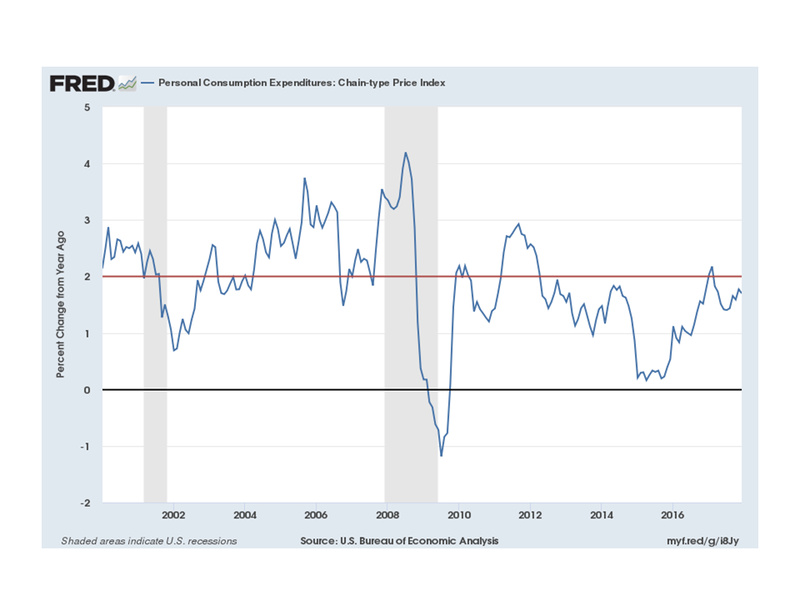 The problem is that the Fed could continue to increase interest rates when this is not warranted, overshoot inflation, and continue to hike, thus overshooting even more. Fortunately, that's a politically difficult route to take, so I doubt it happens.